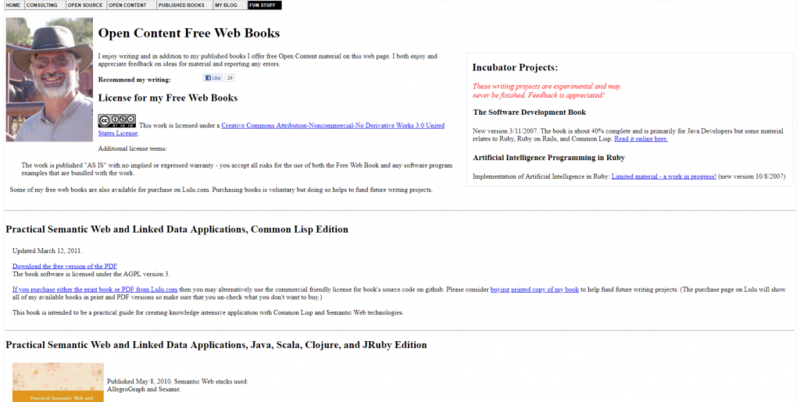 This Open Content book covers AI programming techniques using Java. The latest version has a completed new chapter on statistical natural language processing and a new section on embedded expert systems, and a new chapter on spam detection. This is not the original book written for Morgan Kaufman Publishers. This book contains all new material. Natural Language Processing – a simple ATN parser that uses a huge lexicon derived from Wordnet data, material NLBean project, and an embedded Prolog parser (includes Sieuwert van Otterloo’s fine Prolog implementation in Java). Neural Networks – utility classes for Hopfield and back propagation. Only includes simple examples to show how to use the utility classes.